I was always the kid at school whose birthday fell in the holidays before school started. While it may seem like a great thing to be on holiday it never felt that way for me, I always felt that I missed out on bringing cupcakes to class or getting all the attention for the day from people who wouldn’t otherwise know it was my birthday. As I’ve grown up I’ve realized these things aren’t actually important and now that I’ve started working I’d be pretty happy to still be on holidays come late January! I don’t generally do anything fancy to celebrate but this year I wanted to have dinner with the friends that got me through med school and I was lucky enough to have some of my new colleagues come along too. I find the great thing about starting a new job is meeting new people and although it’s only been a couple of weeks I feel as though I’ve already made some great friends – some of which are people I previously knew (but not well) and some who I’ve only just met. Instead of making cupcakes I decided to make a slightly more grown up birthday treat – chocolate and raspberry truffle cake. This cake is rich and decadent and a small piece is probably enough (although that didn’t stop some people from having seconds). Layers of light spongy cake studded with raspberries are sandwiched between creamy rich chocolate truffle frosting. 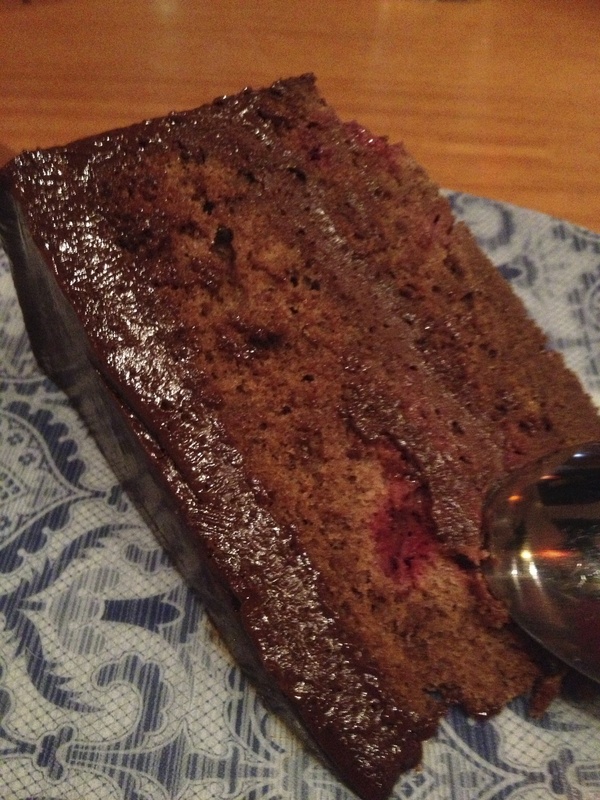 The raspberries are tart enough to set off the sweetness and the cake layers aren’t so dense you can’t finish. 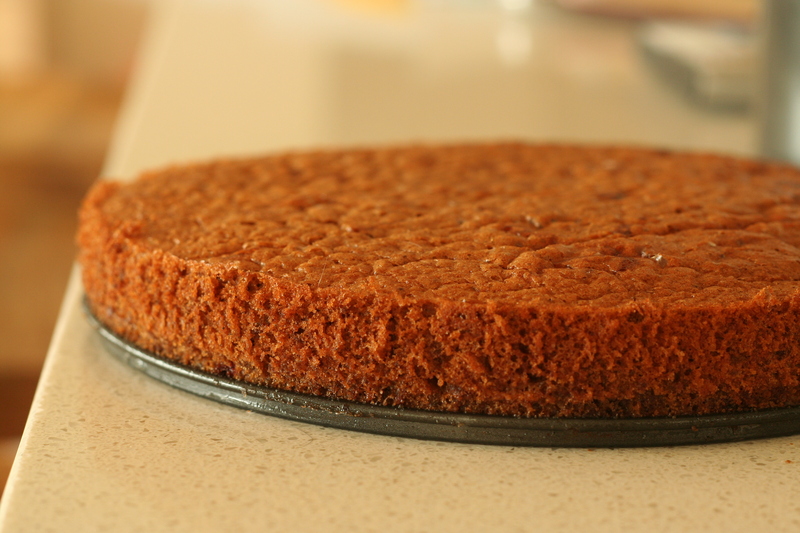 I love the technique of pouring the frosting over the cake while it is in the tin to get smooth layers. This saves on frosting time and looks really elegant. You may have to do some touch ups after removing the tin, just use a warm dry spatula to spread leftover frosting where needed. The cake is open to all sorts of decorating possibilities but I loved how simple and classy it looked plain (and this looked even better with sparklers in it at dinner). I apologize for not having a decent photo of the cake cut but it was a dark restaurant – trust me when I say that each layer was defined and evenly spaced and looked fantastic. Preheat your oven to 180º and prepare two springform baking tins. Beat the eggs and sugar in a bowl until thick and creamy (at least 5 minutes) then sift in and fold through the cocoa and flour. 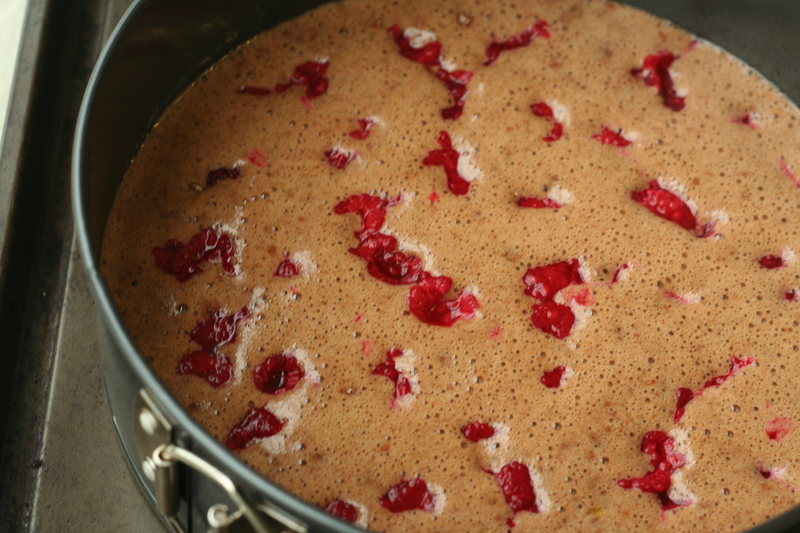 Divide between the two tins then sprinkle the raspberries over the top. Bake for 25 minutes or until set. Allow to cool in the tins. Melt the cream and chocolate over a low heat until melted and smooth. In a separate bowl whisk the eggs and sugar over simmering water for at least 5 minutes or until thick and creamy. 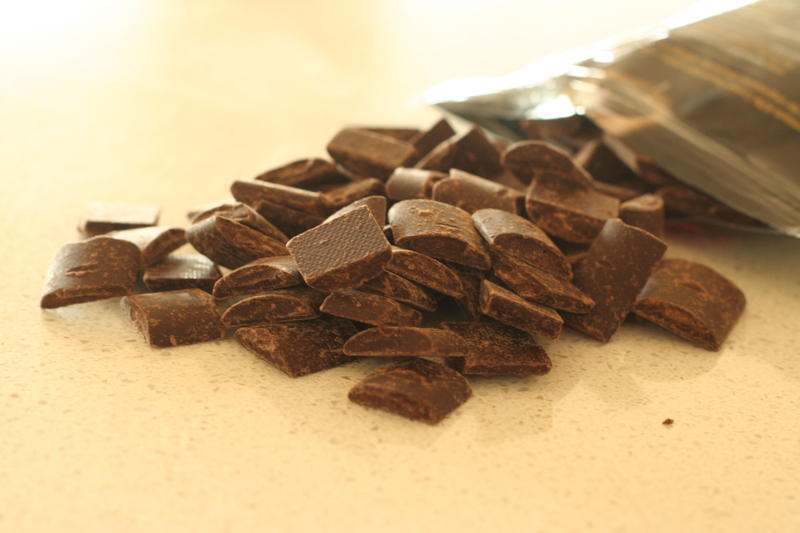 Fold the chocolate through the eggs and beat on low speed until cool. 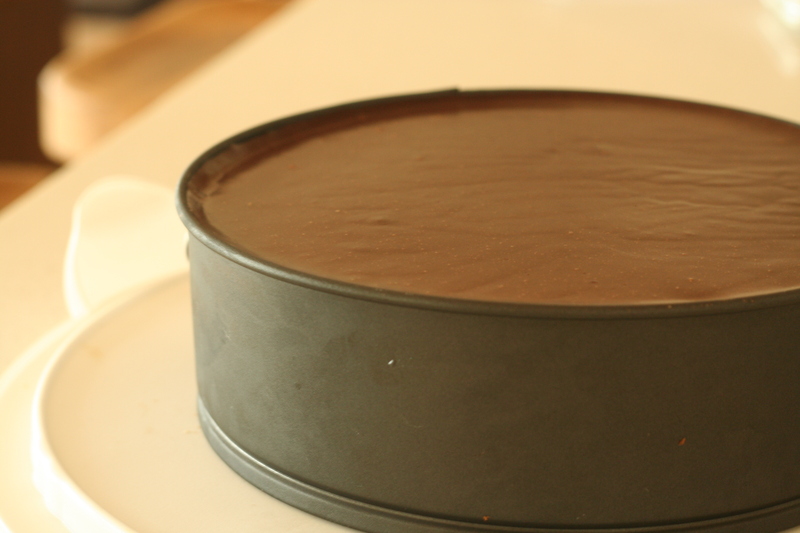 Place one layer of cake in the springform tin then pour over half of the truffle filling. Place the second cake on top then pour over the rest of the frosting, it will run down the sides of the cake. Place in the fridge until cold and set. Carefully remove the tin after warming the sides with a warm cloth. This looks so pretty and delicious. Chocolate and raspberry…so yummy! That looks amazing. I am almost drooling and it’s only 06:30! Beautiful photos. It’s like looking at a still-life. this looks decadent and very lovely! Droool!!! Makes me even more sad that I couldn’t make your dinner. What an elegant cake. Iced to perfection too. i love it! Oh wow! That is completely making my mouth water, the icing is fantastic, and looks so perfect! 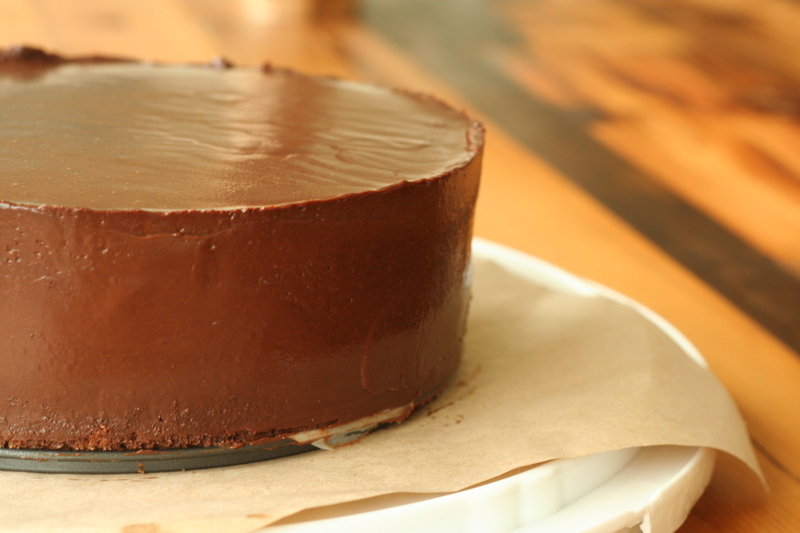 ooo la la…such a beautiful chocolate cake. so rich!! It looks perfect– for a nice valentines dinner. This looks amazingly beautiful and moist and tempting! I love the combination of tart raspberries with chocolate. And I love your blog! 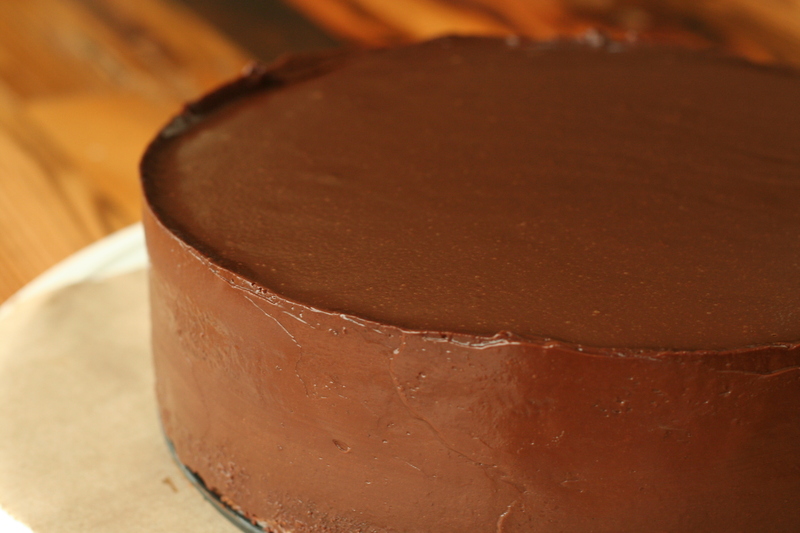 That’s a beautiful frosting job – my goal is to conquer cake frosting this year. 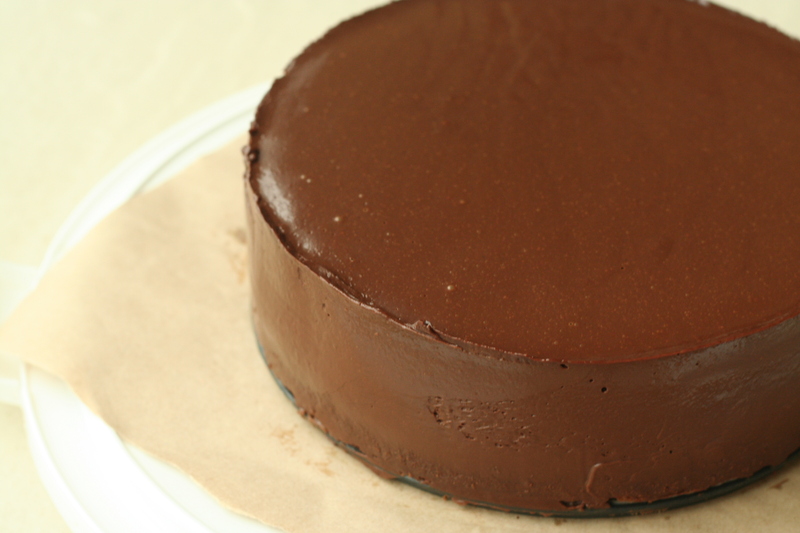 And the cake looks so moist and decadent. You can’t go wrong with chocolate and raspberry. And I know how you feel with the summer birthday. Mine’s in July and it sucked missing out on all the treats my classmates got on their birthdays. Oh well! What a beautiful tart–I hear you, girl! I’m an August baby, and growing up all my friends were always away for vacation, meaning the most I got was a month late “birthday” celebration in mid-September along with 10 other summer babies. Not quite as epic when people are singing your name along with a dozen others for “your” special day! I’d love to make myself an adult birthday treat now, though. Love it! Your frosting looks really pretty! !